Click here and here for high-resolution versions of these pictures. When I began foodblogging in earnest, I decided that I wanted to have a vegetable-focused foodblog without making the crossover to vegetarianism. I like chicken, butter and eggs too much to ever consider giving them up entirely. That being said, these days I eat much less red meat than I used to, although I won’t say no to a nice piece of steak every now and then. Melt one tablespoon butter in a large skillet. 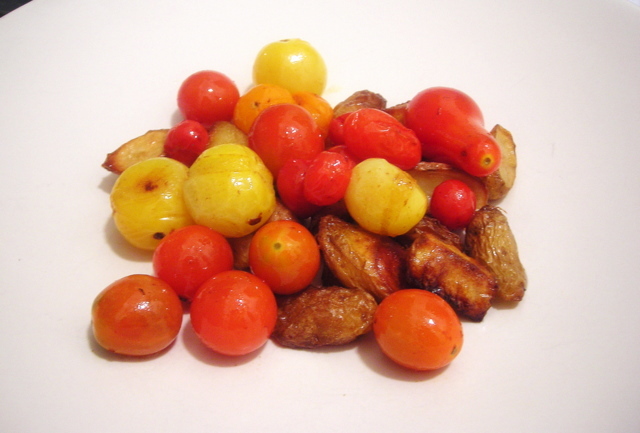 Add fingerlings and toss to coat. Place potatoes in a roasting pan or Pyrex baking dish. Sprinkle generously with kosher salt and freshly milled black pepper. Roast in a pre-heated 375 F oven for 45 minutes or until potatoes are golden brown. About 15 minutes prior to service: Melt one tablespoon unsalted butter in a large skillet. Add heirloom tomatoes to pan and briefly sauté tomatoes until their skin wilts slightly. Remove from heat and set aside. Add sage leaves to the pan and sauté until leaves are wilted, about 30 seconds. Assembly: Spoon fingerlings onto a salad plate. 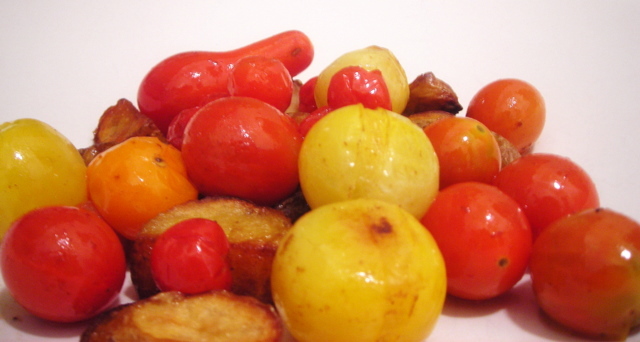 Spoon tomatoes over roasted potatoes. Allow about 1/2 cup per serving. Scatter fried sage leaves if desired and serve immediately. Makes 2 servings as a side dish. 05 Oct	This entry was published on October 5, 2009 at 6:04 am. It’s filed under autumn, food, general, vegetarian and tagged dinner, food photography, heirloom tomatoes, potatoes, salad, seasonal and local, vegetarian. Bookmark the permalink. Follow any comments here with the RSS feed for this post. I like the sage leaves with this! You know, the funny thing is that when I tried sautéeing the sage, it didn’t turn out so well which is why you don’t see any in the pic. It sure tasted great though. Thanks for stopping by Donalyn.